When the dreaded “check engine” light switches on, today’s drivers have a choice to make when scheduling service appointments. Where do they go? Who can they trust? Calling their dealership is one option. Or they could go to their local mechanic, visit a specialist auto shop, text their brother who likes tinkering with cars . . . the list goes on. Consumers have plenty of choices when it comes to service—and in the age of everything being available on demand, this variety works to their advantage. Unfortunately, they’re not choosing dealerships: Fewer than one in three service visits take place in a dealership, according to the 2016 Cox Automotive Maintenance & Repair Study. This not only costs your dealership service revenue, it robs you of the opportunity to provide value for your customers after the sale. To experience truly profitable growth, turning this trend around is essential. These three tips will help you earn your spot as your customers’ top choice for service. Ask customers why they don’t make service appointments at the dealership, and you’ll probably get this answer: “Dealers charge more than the other guys.” This perception is a major hurdle for dealerships—even though it isn’t accurate. The average cost of routine maintenance at a dealership is actually on par with third-party providers, according to the 2016 Cox study. Still, customers won’t make an appointment if they think they’ll be overcharged, even if in reality they won’t. To bust the myth that dealerships cost more, price transparency is your best bet. In fact, Cox Automotive Market Research reveals 70% of customers believe that having a cost estimate before scheduling an appointment is very or extremely important. Your customers get bombarded with digital ads and email offers for “$19.99 oil changes.” No wonder they’ve come to expect upfront pricing. By providing accurate cost estimates when a customer schedules an appointment, dealerships can prove how competitive their pricing really is, and win over once-cynical customers. Today’s customers are more strapped for time than ever. The 2016 Cox study indicates 59% of customers who visit dealerships for service schedule appointments so they can get in and out on their own timeline. 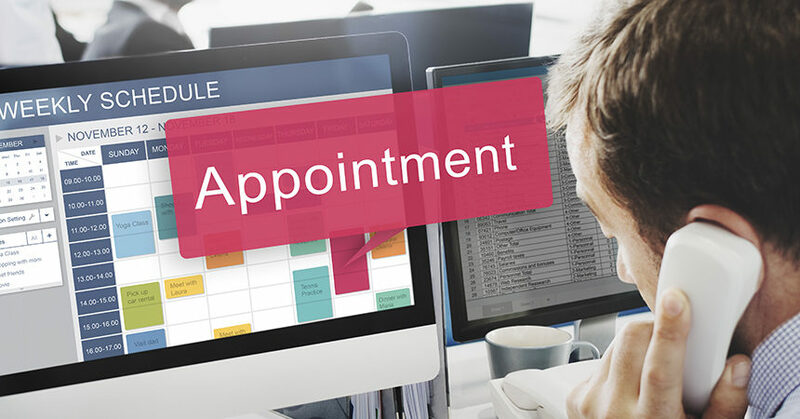 Unfortunately, although having an appointment is convenient for customers, too often making one isn’t. Your customers can go online and order any product imaginable with just a few clicks. They’ve come to expect that level of convenience in every aspect of their lives, including your service drive. Even though only 14% of dealership customers make their service appointments online, it’s not because they don’t want to. Almost half the time, it’s because they didn’t even know it was an option, reports the 2016 Cox study. Your investment in the right online scheduling software will allow your customers to log on, find their preferred appointment slot, and reserve it with a click, tap, or swipe. Once you offer online scheduling, make sure customers know about it. Feature it in your marketing, mention it in your consultations . . . whatever it takes. If customers can find it, they’ll use it—and they’ll thank you for it, too. Customers don’t just expect a transparent, convenient experience while making their appointment: They have the same expectations for the appointment itself. Chances are, this isn’t news to you: 94% of dealership personnel already believe a high-quality service experience is more important than the repair itself, per 2016 Xtime Market Research. But how can you deliver that kind of experience? To answer that, think about what usually happens when a customer enters your service drive. At most dealerships, the customer gets out of the car, walks to the podium, waits for a service advisor, and then waits even longer as the advisor leaves to look something up in the office. Not exactly an ideal experience, is it? Now imagine what could happen if your service drive took advantage of tablets. Your service advisors could greet customers right at their vehicles, with relevant vehicle history information, service menus, and accurate pricing in the palm of their hand. Beyond the obvious benefit of a shorter wait, tablets boost your service advisors’ credibility and make their recommendations more transparent. No wonder tablets increase dealership CSI scores by an average of 72 points and increase service retention by 11%, according to 2015 J.D. Power and Associates/McGraw Hill Financial research. The landscape of vehicle service providers might seem large and complex, but modern customers’ expectations are simple: They want quality service delivered on their terms, and they want it at a competitive price. If your dealership’s service drive delivers the value, convenience, and quality experience that modern customers prefer, you’ll be at the top of their list. Jim Roche is the senior vice president of marketing and managed services at Xtime.